The object of the hyphen in the compound modifier should normally be clarification. Adjectives in a compound modifier sometimes precede two nouns. In the phrase small-jet engine, the hyphen tells us the engine isn’t small for a jet, but the jet itself is probably one of those bijou executive models. Adjectives can also describe other adjectives, as in eerie-blue eyes, where the hyphen tells us the eyes were an eerie-blue shade. The compound modifier is handy because it can be a briefer, more direct way of describing something. Eyes that were an eerie blue gain immediacy by calling them eerie-blue eyes. But does that mean you should jump on every pair of adjectives following a noun and manacle them together in front of the noun? She wore a gown of silver and blue. She wore a silver-blue gown. The conjunction in silver and blue is your tip-off. It means the adjectives have equal weight, so the gown could be, say, blue with silver trim, not a distinct silver-blue shade. Before a noun, they should be separated either by a comma or a conjunction. So how do you know when two adjectives have equal weight? There’s a simple test. When you write a phrase like little red wagon, you can be fairly certain that red can’t be described as little; it’s the wagon that’s on the small side. No hyphen is needed. So they’re separate (but not equal) adjectives. Red has been given greater weight than little by its proximity to the noun and the absence of a comma or conjunction. If the two adjectives had equal weight, long-standing convention would suggest a comma or conjunction. The quick test for equal weight is to ask yourself: “Would I ever say the little and red wagon?” I think the great majority of native English speakers would say no. (This is a question that can’t really be answered by a rule from on high. It comes under Noam Chomsky’s heading of “deep” grammar — something you just know because it’s your language. *) So little red wagon requires neither a hyphen nor a comma. Although the weight given to the two adjectives, and the choice between comma and conjunction, is a question of emphasis (and therefore discretionary), the principle of equal weight makes it clear that the silver and blue are discrete entities, each describing the gown in its own way. As someone who has spent a lifetime looking at how sentences work, I think the rush to hyphenate every descriptive phrase that precedes a noun illustrates the absolutism that seems to plague the subject of usage. You needn’t review the tortuous explanation I just gave every time you decide whether or not to hyphenate (although you can consult a fine, long list in The Chicago Manual of Style if you’re worried). Basically, a writer should ask himself or herself what the sentence actually means and whether readers will be able to understand it. When these questions have a clear answer, the sensible use of orthographic marks (hyphens, apostrophes and such) often becomes clear. *An example of deep grammar is that you might tie a yellow ribbon ’round the old oak tree, but you’d find it really odd to tie a yellow ribbon ’round the oak old tree. And no one has yet formulated a convincing rule that tells us why this should be so. If there were an answer, it would stray well into philosophical arguments like the primary and secondary qualities of objects. Aargh! Could the answer to that last conundrum (why we don’t say “tie a yellow ribbon ’round the oak old tree”) be that trees are primarily classified as types — oak, maple, pine, et al. — not as tall or short, young or old, therefore “oak” appears closest to “tree,” not “old”? Surely, in the case of the ‘old oak tree’ the tree is specified an oak tree first, regardless of age, i.e. grammatically as a loose compound; thereafter we describe it, in this case as old. Another splendid observation. I think I am becoming a groupie! I have a hyphen-usage question stuck at the back of my mind, but I absolute cannot come up with an example. It’s something about use of the hyphen where it is clearly appropriate but there are two nouns modified by the word that precedes the hyphen. . .Sort of “small-jet and helicopter engines,” except I suspect that as a real world example that would make no sense in the first place. Great article as always. This is a great gadget to have in my iGoogle. And I understand the “old oak tree” dilemma. Who’s to say it’s not an oak old tree? Both old and oak have equal value. It’s simply ‘deep grammar’ or a colloquialism. In “the old oak tree”, one would assume that the adjective “old” qualifies the compound noun “oak tree”. You could happily shorten “oak tree” to “oak” (or if you were living 100 or so years ago you might even have hyphenated “oak-tree”). There’s no way you can stuff the adjective in the middle of the compound noun, and that is why it sounds wrong – it’s not so much deep grammar as ordinary grammar. Thus this is IMO not the best example of “deep grammar”, though I take the conceptual point that there are indeed things that just “feel wrong”. You have two terms that are, together, describing a third term. Also, the first of those two terms describe the second one. Let’s look at another example: “little red car.” Here, “little” and “red” are not, together describing the car. The are doing it individually. In fact, we can put an “and” between them without changing the meaning (though it might change the emphasis). Also, the first term, “little,” is not describing the second term, “red.” Because this doesn’t fit our algorithm, we wouldn’t hyphenate it. This is also the reason why we write “the 3-inch beetle.” Here, “3” and “inch” combine into one description of “beetle.” Also, “3” tells us something about “inch,” namely, how many inches. Thus, it gets a hyphen. I think I’ve learned a bit from all these comments. Tony must be right about “old oak tree”. I don’t know if there’s a formal category known as “loose compounds”, but there must be many combinations spelt as two words but tacitly conceived as one. “Little red wagon”, however, still appears to be a usage without a specific rule to guide it. I’ve sent Kathryn a longer answer to her query about jets and helicopters but hope she comes up with more examples. And I had one of those “snap” moments with the comments from Precise Edit. I’ve always found it easier to punctuate some sentences by thinking of mathematical set theory, and that’s how Precise Edit has explained the example as well. PS I’m not really used to WordPress yet, so I see that my mechanics look a bit patchy. Some of my italics seem to have disappeared, for example. On the other hand, an editor or writer who believes that a single pair of eyes should be a sufficient guarantee against blunders is like the doctor who treats himself or the lawyer who takes himself as a client. And please excuse my “sexist” reflexive pronouns. It’s just my age. I think the whole “loose compound” thing is worth thinking about. Agreed–in “old oak tree” the adjective “old” describes a noun phrase consisting of “oak tree,” and agreed also that “loose compound” is a potentially useful way to describe that noun phrase. What I find fascinating–and this may go back to your reference to deep grammar (although I’m finding it a bit daunting to read up on that online! )–is that to a native speaker of English there is a hierarchy functioning, under which one can easily say “old oak tree,” but could say “oak old tree” only in very limited contexts (such as poetry, or where “oak old” served an important function in context). One could imagine a context in which “old tree” was the loose compound: “She ran to the first old tree she could find.” “He preferred the shaggy old tree to the trimmed one.” In those sentences, “first” and “shaggy” do not weigh what “old” does–they are subordinated to it. But while one could reverse old and shaggy (not necessarily in that sentence) quite easily, it is difficult to reverse the order of first and old. So there seems to be some innate hierarchical ordering principle at work, which differentiates based on the actual words being used. Hm. If there is, it is probably fodder for another post. There was a post a while back about the order of adjectives…I’m 99% certain it was on dailywritingtips.com. Hmmm. Is it impossible to have a shade of blue that veers towards black? Midnight blue is fairly close. Are we talking about syllabic stress patterns here? Or perhaps even vowel stress patterns? It seems to me that we say “old oak tree” because of the higher stress on the word “OAK.” So, it seems natural to say “old OAK tree,” rather than “OAK old tree.” It is the natural poetry of our language and the pattern of stressed versus unstressed sounds. The second sentence “comes trippingly on the tongue,” so to speak, with a nice rhythm and mild alliteration. The second sentence is one you would be more likely to remember. The whole hyphen issue is a mystery. It seems like most of us have memorized these things but I do not recall a specific rule or set of rules that govern the use of hyphens, or for that matter, open or closed compound words. This is an interesting topic and one in which I am going to have to do a little more research. We have a car. What color is it? Not blue but “sky-blue.” Here, the terms “sky” and “blue,” together describe the car. Using either one alone would change the meaning. Changes the meaning: A “sky-blue” car is different than a “blue car” [different color] or a “sky car” [different technology]. Why is the royal order important? Well, for one thing, it helps us know whether or not to use a comma between “old” and “oak.” “Old” refers to age, and “oak” refers to material. They are not in the same class of adjectives, so we don’t need a comma between them. The royal order also gives us a clue that we will change the meaning if we change the order of words, which also indicates that we don’t need a comma. Is this truly important? Yes. A “silver looking glass” is different than a “silver-looking glass.” The first is a looking glass (mirror) made of silver. The second is a glass that has a silvery appearance / look. Interesting and helpful, Precise Edit–although I’m still struggling to fit “oak” into the hierarchy. Material? That’s where it would go if the noun being described were a desk, but it seems wrong, somehow, to treat it the same when the noun being described is the living tree. But you never achieve complete precision in talking about language, and that chart is unquestionably a very useful tool for organizing one’s understanding of adjective use. Thanks! Garrision’s comment raises some interesting points. The topic of stress is certainly relevant to the way we conceive words. The commonest way in which new words are formed in English is through compounding. And one of the ways in which we know a word is moving towards a compound is stress pattern. Two single syllable words will often have equal primary stresses, but when they are compounded, the stress moves to the first word. Thus, when we say that police are going to “crack down” on holiday drink-driving (drunk driving, US), “crack” and “down” have more or less equal stress. But if we say that police staged a “crackdown” on drunk drivers, we can hear the two words merged into one by the shift in stress to “crack”. It doesn’t always work this way. I’ve noticed, for example, that “goodwill” (or “good will”) is more and more often being used as a single word on both sides of the Atlantic, although this combination is usually pronounced with equal stress on both syllables. AP lists “good will” as two words when used as a noun and one word (no hyphen) when used as an adjective. If you say “goodwill gesture”, you can hear the shift in stress to “good”, so this seems to follow my rough guide. But the Burchfield (1996) and Allen (1999) editions of Fowler’s Modern English Usage both list “goodwill” as a single noun when it refers to the established reputation of a business, and two words when referring to virtuous intent. We have similar problems with the pair common sense. But I won’t labour the point with more examples. As for your examples of hyphenation, it’s small wonder they mystify you, and believe me, if you consult multiple authorities and multiple dictionaries, you may be able to discern a majority in favour of one spelling or another, but you will never get complete agreement. For example, The Chicago Manual says that it’s never incorrect to hyphenate compound modifiers when they come after the noun, but then again, it refuses to say they’re incorrect either. Without rushing to consult further authorities here, I’m going to chance my arm by saying most educated users wouldn’t hyphenate a compound adjective following a noun. But that is a mere impression. To settle such a question, you’d need a concordance of written English usage. 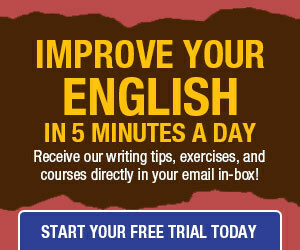 There are several spoken and written concordance projects, but they go far beyond the scope of dailywritingtips. Most of us will just have to choose a dictionary that appears to command respect (you can’t go wrong with Oxford or Webster), consider its advice and cross our fingers for luck. But note that dictionaries are much less prescriptive than they used to be and will often give two, occasionally even three, acceptable spellings. In the end, you may actually have to make a personal decision. Precise Edit has given us more to think about. Thanks for the reference. I haven’t explored the entire site. But I do know from my study of linguistics that there are no absolute rules about every set of adjectives. Their order can be idiomatic. What you say about the order of various pairs makes good sense, but your examples seem to take us back to what I said originally about ambiguity. If you’re the writer, you have to consider what you actually mean. If you’re the copy editor, you may occasionally be in hot water if the context doesn’t reveal the writer’s meaning. Will consult those other posts and get back. Thanks again. But that may be a topic for another article altogether. For Garrison: Please excuse me. I’m confused here. “Crackdown” is the noun, not the verb. The verb is “to crack down”. So there’s no problem about “cracked down” being the past tense. I’m not sure what point you’re trying to make. It is I who must apologize. I’m the one who got confused originally because I had been thinking of a completely different example. How my thinking shifted to “crackdown” I will never know. Garrison: do you use “login” as a verb? I’d consider that an error. It’s a noun, referring to your username, or username+password, or whatever, but what you do with it is “log in” (two words). I’ve finally had a chance to look at the article on the so-called Royal Order of adjectives and the site with the chart. The order in the list corresponds pretty well to the ways in which we normally use adjectives, but there is no rational, or even “traditionally grammatical”, reason for them, which is the point I was trying to make. The Royal Order is a rule of a sort, all right, but it isn’t like subject-verb agreement or dangling participles. 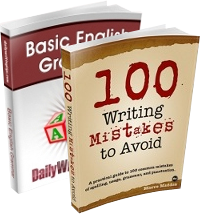 Educated speakers often make mistakes in subject-verb agreement through simple inattention. It’s actually more difficult for a native speaker to make mistakes in the order of adjectives, even if the speaker in question is illiterate. I agree with Jacquelyn Landis that these are patterns we manifest as small children. In other words, some time before questions of formal usage arise. You often see these lists of adjectival order in an EFL/ESL context. It may well be necessary (though hellishly difficult) for foreigners to learn them, but native English speakers will be more or less faithful to these patterns without ever being obliged to learn them explicitly. Setting them out as rules for writers seems superfluous. For a native speaker, saying “red little wagon” would feel as wrong as saying “grows tree a Brooklyn in”. It just wouldn’t be English to us. And this is the way Chomskyan deep structure was explained to me as an undergraduate, though that was so long ago that I could well be wrong. I’d welcome clarification. I haven’t yet discovered a credible source for the name “Royal Order of Adjectives”. I’ve seen the suggestion that it was meant to humorously compare the Royal Order of the Garter (and other honorary orders) with the [Royal] Order of Adjectives. Could be correct, but it sounds neither convincing nor especially amusing. I’ll keep rooting about to see if I come up with anything more. And thanks for drawing this to my attention. Please could someone let me know why there is no hyphen or comma in the phrase ‘key growth markets’? Given that the ‘key’ relates to the ‘growth market’, is there some grammatical indicator that points to this grouping of the final two words? Has the ‘growth market’ become a noun with two words? Clearly a grouping of the first two would occur if you substitute ‘key’ for ‘high’ and a hyphen would be required between them to provide ‘high-growth markets’.